Click image to read full article at International Business Times. This article made me so incredibly happy and I’m not even sure why. 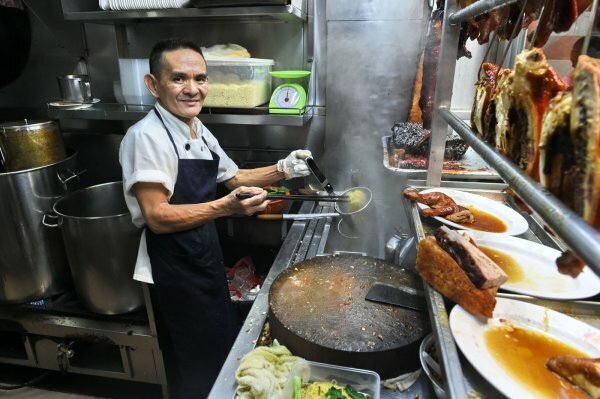 I clicked over to the International Business Times site (image above) and started reading about how this street food vendor named Chan Hon Meng in Singapore received a Michelin Star. Wow. Just ‘Wow’. What an amazing feat. Never before have I ever heard of a street food vendor receiving one before. It’s not the most glamorous life being a food stall worker, especially in Asia. The flow of customers is constant, you’re constantly competing on price with other stalls, it’s freaking hot depending on the season, it’s even hotter because you are cooking on top of the weather, and so much more. It is a very tiring job, so it’s wonderful seeing someone being rewarded for a job well done. Especially since Michelin stars are typically associated with fancy restaurants that serve things like braised carrots stuffed with foie gras on a bed of grilled endive with herbs harvested from a garden on the room (I made that up, I was just trying to give an example). Meng’s food stall is known for its soya chicken and BBQ pork that you can get for about $2. I’m just really excited for him, I guess.